A member of the NUT in Birmingham has apologised to parents for today's strike, which meant many children could not go into school. But Kevin Courtney also said it was necessary for parents to see that the Government has caused teachers to have to go on strike. The Government says it's surprised the strike took place, as talks are underway with unions. Thousands of schools across England and Wales forced to close as teachers strike and threaten further action. 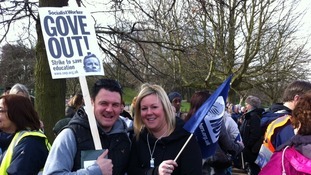 Teachers have been marching in Nottingham today as part of their strike. The National Union of Teachers is campaigning against pay, pensions and working conditions. A Nottingham NUT member has explained the reasons for today's teacher strike to ITV News Central's Education Correspondent, Peter Bearne. Susi Artis says changes to the structure of education in the country is a main reason behind the strike, as well as pay and pensions. She spoke during the NUT march in Nottingham earlier today. More than 300 teachers have marched through Nottingham, as they strike over pay, pensions and working conditions. Today's march ended with a rally and speeches in the Old Market Square. Teachers on strike today over pay, pensions and conditions have been protesting in Birmingham's Victoria Square. Half of the British public oppose teachers going on strike today, according to an ITV News Index poll carried out by ComRes. When asked whether teachers were right or wrong to go on strike, 51% said they opposed the walkout, 35% supported the strike and 14% did not know. The poll also showed that those working in the public sector are more likely to support the strike (45%) than oppose it (41%). Some 2,039 people were asked by ComRes about the strike. Members of the National Union of Teachers demonstrated in one of Birmingham's central squares today over workload, pay and pensions. More than 300 teachers from the NUT are preparing for a march through Nottingham city centre. The union is staging a one-day strike in its ongoing row with the Government over pay, pensions and workload. Is your school affected by teacher strike action? Hundreds of schools across the Midlands are expected to be closed or partially-closed today because of a one-day walkout by teachers in an ongoing row over pay and conditions. The national strike, called by the National Union of Teachers, has been condemned by the government for the disruption it will cause to families. For a list of closures across the Midlands click here.